One of the best matches of the day, betting wise and as a fan too, would be the 1st round of Pullach Challenger; a match where we will have two youngsters battling for a 2nd round appearance + 2,180 € in prize money and 10 ATP points. The first one is Mikael Ymer (younger of the Ymer brothers), a 19 years old Swede that stands at 1.83m tall and which uses a Right-handed forehand and two-handed backhand. This kid has huge potential, but sadly he didn’t quite get there. He is ranked #336 with the best ranking of #310. His best results so far were reaching 2 finals in Sweden ITF (F3 and F5, clay and hard) and another one in 2017 in France F4 (hard). His most notable result came in 2016, winning Stockhold ATP in doubles along with his brother, Elias. That was a huge surprise for everyone as they have won 4 matches to win the title and all as underdogs. This year he has 34 wins and 17 losses on all surfaces, and 13 wins and 10 losses on clay. His recent results are OKish, but surely nothing special. He has reached the R16 in Lyon, losing to Kecmanovic, lost in 1st round of Blois to De Schepper, lost in Qualies in Milan to Masur, reached SF in Bastad challenger (he loves playing in Sweden), won a set to Fognini in Bastad ATP and now he won 3 qualification matches in Pullach. He defeated here Prechtel 6-4 7-5, Bergs 6-4 6-1, and A. Muller 6-3 6-3. His biggest weapons would be the movement, stable and reliable groundstrokes (uses very well the BHDTL too) and his serve (which not that reliable). His biggest weaknesses are mental, for sure. He is really able to choke a lead in each match and also has given up on so many 2nd sets despite winning the 1st easily… That is one huge problem. The second big problem is the moment his game isn’t working he starts losing it and hitting unforced error after unforced error. A good example would be the match against De Schepper lost 6-2 6-3 (a guy with a 4-12 clay record this year). The second player in this match is #251 in the rankings, 17 years old German hope, Rudolf Molleker. Funny that the younger of the two had bigger results. Molleker has an 18-8 record on clay this season and a 28-16 record overall on all surfaces in 2018. 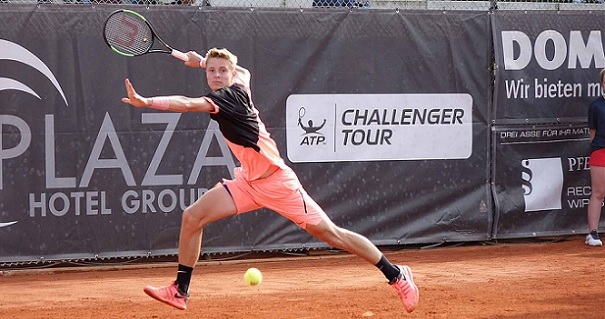 This kid managed to win Heilbronn 2 Challenger defeating the likes f Lopez-Perez, Hanfmann, Vatutin, Londero, and Vesely… winning 4 consecutive matches in 3 sets (3 of them from one set down). He also got to an ITF final (lost to a red-hot Serdarusic). One of his most notable wins is for sure the battle against Ferrer in Hamburg, where he won 2-1 and almost 3 sets of tennis played. Molleker is an offensive baseliner with a great serve. His movement is really good and he isn’t afraid to use his weapons in any circumstance. Considering that the surface suits both equally, that the match will be held in Germany (where everybody adors Molleker) and that Molleker has the better short and long-term form… I guess he should be favored by the odds. He is now 2.35 at Bwin and I would price him around 1.80-1.90 against the Swede. Ymer has his chances, but this price is just too valuable and too juicy for me to ignore. 10 units!